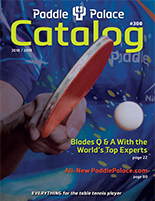 Juic Table Tennis / Ping Pong Pro-Specials at Paddle Palace Table Tennis Co.
JUIC PRO SPECIALS: Super Deals on these great blade and rubber combinations! Choose the Pro Special that suits your style! These blades and rubbers are popular with tournment-calibre players and are well-suited to a wide range of playing styles. All are custom pre-assembled at Paddle Palace with smooth, inverted ITTF-approved rubber with red on one side and black on the other..